I must admit that I admire anyone who can bring out a book on the greatest players in any sport. Their readership does not necessarily have to agree with their choices but, if robust debate is what author Geoff Armstrong has in mind also, terrific. This is the third updated edition. I must also say that I love Australian cricket tomes which regularly appear. Heaven knows what postage might cost if these books had to be sent from Australia but New Holland Publishers are wise enough to have an office in London. This is another weighty book and includes a very gracious and interesting Foreword from Steve Waugh – included at No.47: he could hardly have been left out not just for his cricketing prowess but for writing for the book! – who is another author of epic titles. 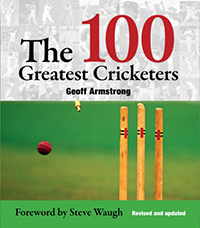 The 100 Greatest Cricketers is broken down into nine XIs with Geoff Armstrong’s favourite player, Doug Walters, making up the hundred. It is remarkable to wonder how these nine XIs spanning all the years since Test cricket was first played to the present day would fare with and against all the other fine players in this book. Of course, some players have not made it and some players readers may not know anything about but here is a chance to find out in each extensive chapter. Four of England’s top six run scorers with 8,000 runs each do not feature but Geoff has his own criteria for selection which must be respected. Whatever, this is a terrific effort, a real labour of love and the book acts as an encyclopaedia of some of the finest cricketers. Additionally, the quality of the many photographs is high and the book is beautifully presented. It is wonderful to read the book and muse upon what might have happened with each of Geoff Armstrong’s nine XIs and he must be congratulated for his thorough research and end result.